A Facebook “Friend” is offering a photo contest of her own. http://www.cheyennerouse.com I have gotten to know the photography of Cheyenne Rouse. Cheyenne makes her living doing what I wish I could be doing with my own work. Cheyenne is running her own online contest. Though I have been entered in at least a few others including current submissions to Capture Wisconsin, http://www.capturewisconsin.com/, I am not above letting an expert like Cheyenne review my work. I sent her a color version of this image. I should have sent the black and white. Black and white conveys a grittier texture than color. This subject practically calls for it. I did not have to go far for it either. It just meant a Sunday afternoon walk to a neighborhood park. I started with a color image in RAW. Later on I converted to black and white. That conversion is not too difficult to do. Black and white does require a different way of thinking shifting from colors to tones and shades. It really is black, white and various shades of gray in between. With film, this was often determined with the use of red, orange, yellow, or even green filters on the front of the lens. With digital, those filters don’t work in that same way as the sensor doesn’t “see” the image in the same way that film does. Most editor software including Photoshop includes electronic versions of these filters for the same effect. This allows rank amateurs like me to come up with some powerful images. 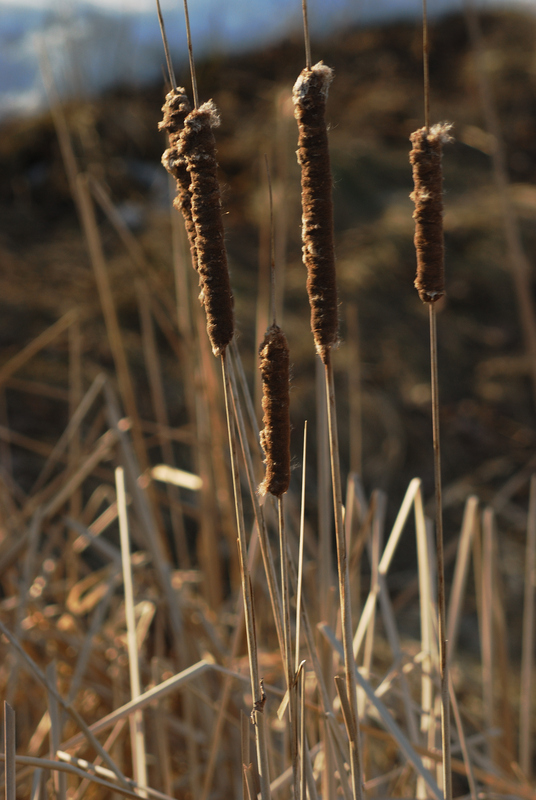 Cattails to me epitomize the wilderness. They usually grow in swampy marsh like areas. This is the beginning of spring and the end of winter. This last Saturday I got frustrated with eBay and UPS will trying to ship out an old typewriter. I grabbed D-80 and just started heading south to Lake Wausau and across to the Town of Rib Mountain. DSLR stands for Digital Single Lens Reflex. Reflex is just what happens when I find some thing that takes me away from the world around me . I through every thing out of my head and focus on the subject at hand. Often is something that others seem to take for granted like the cattails growing just off the side of a frontage road along Highways 51 & 29. County Highway R has a walkway along its entire length from junction with Highway 52 Parkway in Wausau to the junction with County Highway N in Rib Mountain. The road actually gets quite scenic as it crosses the Rib River into the Town of Rib Mountain. It is a feeling of wilderness so close to civilization. This is genuine wetlands preservation at its best when we can stop, pause, Zone out and think of nothing but the warmth of spring. Wisconsin’s winter is ending. Time for new growth. A snake in the wild. 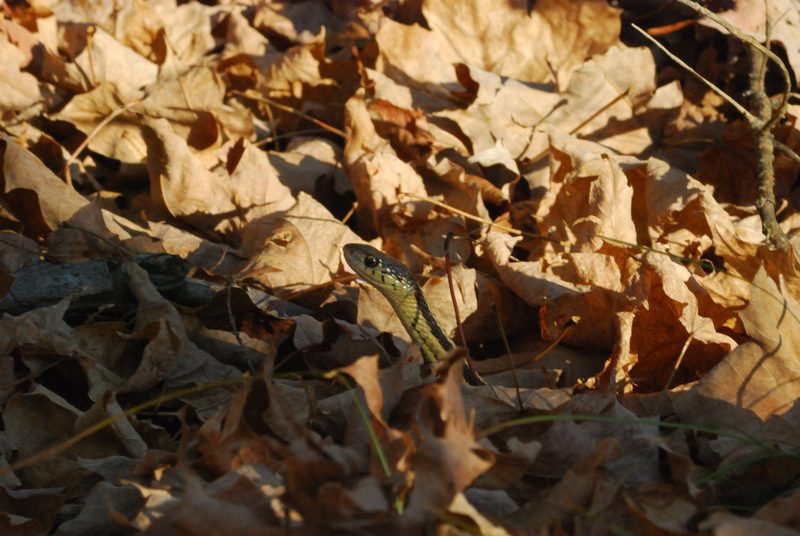 Snakes are part of God’s creation even though their place in the Bible is a bit maligned. Tonight our assistant pastor had caused quite a lot of attention bringing in two live constrictors for the second mid-week lenten worship service under the theme: Curse: Satan’s Curse. And you shall bruise him on the heel.” Genesis 3:14-15 NASB God curses the snake and announces his plan for the salvation of mankind. The serpent has always been depicted as sly. A perfect form for the Great Deceiver to take. In the Passion of the Christ, Mel Gibson had the snake appear from under Satan’s cloak in the Garden of Gethsemane when our Lord prayed to his Father wrenched with fear for the suffering and pain he was about to experience while taking on the burden of our sin and going to the cross. When Jesus went to the cross, he crushed the snake, and we are free. A walk down to the Everest Landing a couple of years ago with my old N8008s generated this image. Nearly two decades ago I had purchased my first AF film SLR, Nikon’s N8008s. This was the first “serious'” camera system that I owned . It led me into a number of things. It certainly led me into the Nikon family of cameras and lenses. That led me into a venture in getting images published. I pursued opportunities to submit my images to a number of publishers on my own, in particularly, with Wisconsin Trails,http://wisconsintrails.com, then part of the Trails Media Group. They had me for a while on their mailing list. They would send me a hard copy lists of their needs for each quarter. Some of those “needs” turned out to be like assignments, and some were in things right out of my own part of the state that I really wanted to promote. In 1998, I joined the local Friends of the Mountain-Bay State Trail, a local citizens group that exists to promote and enhance the use of the Mountain-Bay State Trail, an 82 mile long rail-trail running from the Village of Weston, WI just outside of Wausau to the Village of Howard, WI just outside of Green Bay. Wisconsin Trails had planned to publish an article on rail-trails in Northeastern Wisconsin. That meant both the Mountain-Bay and the WioWosh State Trails. I had a photo of one of my bicycles parked on a bridge from the WioWosh just south of Eland, WI. The editors matched that with one from the eastern end of the Mountain- Bay State Trail by Darryl Beers, one of Wisconsin’s better known outdoor and landscape photographers. My sister, Julie Walraven, was then operations manager for the Wausau Canoe & Kayak Corporation http://wausauwhitewater.org/. Julie had talked me into coming down to the course on the Wisconsin near Downtown Wausau on the east channel of the Wisconsin River without realizing that this was action sports photography which caused me to use my camera’s motor drive. That meant the expense of purchasing film and getting it processed en-mass. With film technology, this meant 35mm slides which had richer color than negative films and allowed for more selectivity in post-processing editing. Both of those factors were important to publishers. Julie was very good at feeding me connections with photo editors, and one of those editors was Kristen McClarty, then working for National Geographic’s Adventure Magazine. It was a big thrill for me to come home from my day job and find out that either Kristen or one of her partners at NGA had called for images. I scrambled to go through my files and package these things as quickly as possible to ship them out via Fed-Ex. I’d get a copy and a check for my work. Kristen was the main factor in getting me to buy my first computer and establish an e-mail account. She simply was tired of playing phone tag and did not like to call me on my cell phone because she never knew where I was or what I was doing when I got the call. It has been a while since I have been published in magazines and I miss that rush. But magazine publishers also change. National Geographic had closed down on publishing National Geographic Adventure about 3-4 years ago, and, Kristen McClarty had also moved on first as a free lance agent, and now with the Bonnier Corporation as an editor for an entirely different kind of magazine, Wisconsin Trails had also changed hands, and corporate headquarters. Originally owned by Howard Mead, it was sold to former Congressman Scott Klug who had the headquarters moved from Madison to nearby Black Earth, a small town just west of Madison. 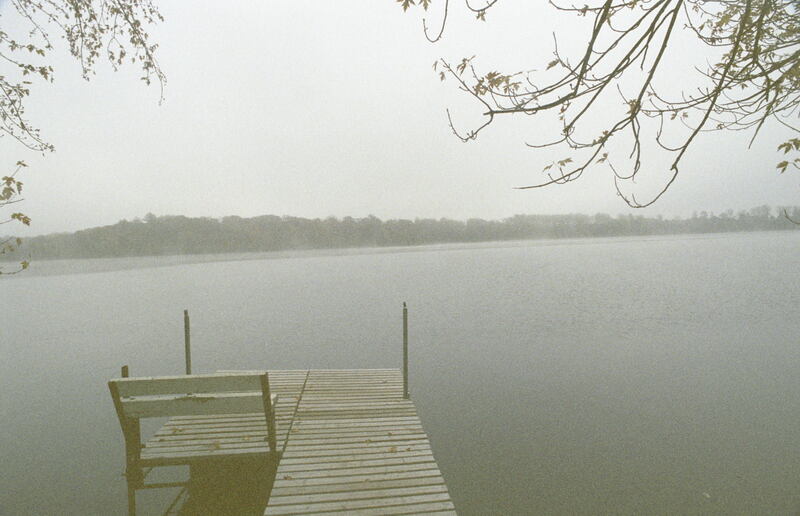 A few years later, Wisconsin Trails was purchased by Journal Communications http://www.journalcommunications.com/ and the magazine’s headquarters was also moved to Milwaukee. Wisconsin Tails is currently staffed by Journal-Sentinel personnel.